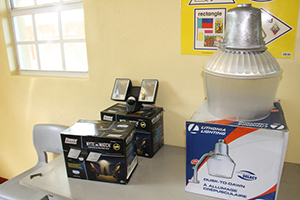 NIA CHARLESTOWN NEVIS (November 06, 2014) — Crime Stoppers in collaboration with the Ross University School of Medicine and Four Season Resort, Nevis, donated on Friday October 31, 2014, security lights to all schools in Nevis. The handing over ceremony took place at the Department of Education Conference Room at Pinney’s Industrial Site. 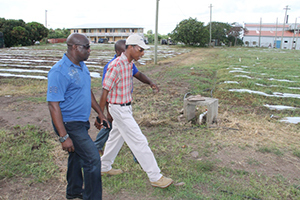 Regional Security Project Manager of Crime Stoppers St. Kitts and Nevis Mr. Veron Lake, said Crime Stoppers recognized the importance of projects and initiatives that benefit the wider community and help to decrease criminal activity. “Additional lighting will encourage approved after-school extra-curricular activities including longer study time, increased feeling of safety and security at night and help to deter criminal activity and reduce the incidents of gang activity, vandalism and assaults,” Lake said. Hon. Alexis Jeffers accepted the lighting equipment on behalf of Premier of Nevis Hon. Vance Amory who is the Minister of Education. He expressed that security in any form was important and that the project in partnership with closed circuit television (CCTV) camera installation should help discourage crime. “Indeed, any form of security no matter what it entails, is very significant in terms of deterrent of crime and antisocial behaviour…A few months ago we initiated a CCTV camera installation project… When you link both of them together, you would understand that we are headed in the right direction,” he said. Permanent Secretary of the Ministry of Education Mrs. Lornette Queeley-Connor, thanked Crime Stoppers and its partners for the donation. She said the lights would enhance not only the safety and security in schools but also in the community. “I see this as a very significant thrust towards ensuring that our children are safe and secure in their school environment … We see this gift as something that will extend further to the wider community,” she said. 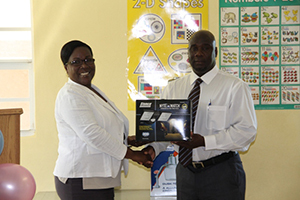 The lighting equipment was handed over to Principal Education Officer in the Department of Education Palsy Wilkin for distribution to the schools. In response, Wilkin expressed thanks to Ross University, Crime Stoppers, Four Season Resort, the Ministry of Education and everyone who made the project possible.